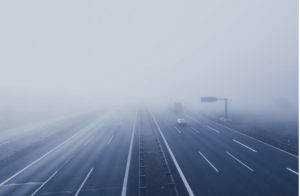 As the Commission unveiled their 2nd Mobility Package and proposal to cut new car and van CO2 emissions, the latest data from the European Environment Agency (EEA) reconfirms that transport is Europe’s biggest climate problem. Note 1. 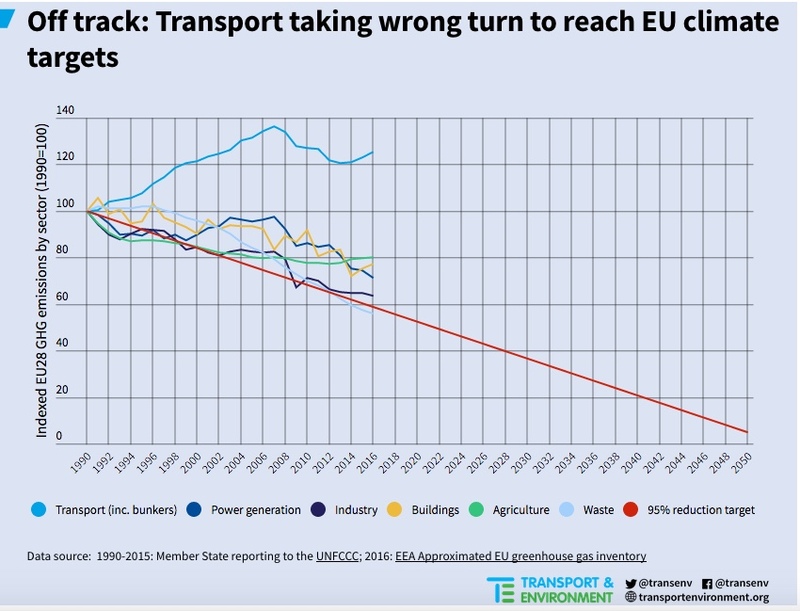 Worse, transport greenhouse gas (GHG) emissions in the EU have risen for the third year running. 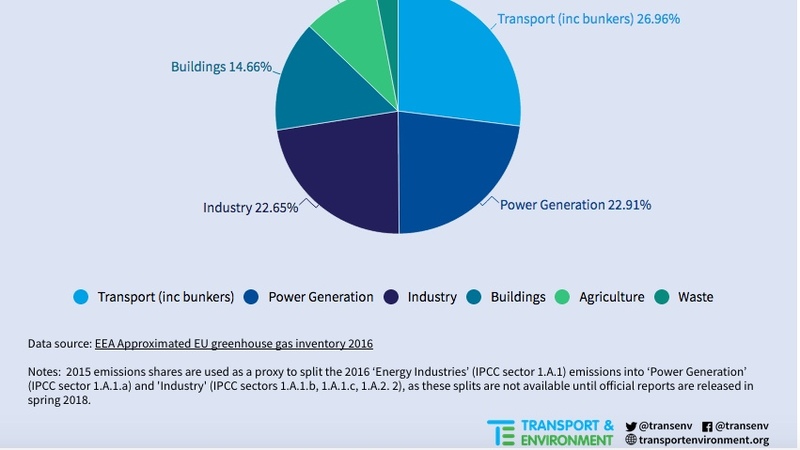 Including the EU’s contribution to emissions from international aviation and shipping, (‘bunker’ emissions), transport emissions now represent 27% of the EU total, the largest piece of the pie. Total EU emissions had been steadily declining since peak emissions in 2007, but they have flatlined from 2014, shedding merely 0.2%. 95% of EU transport (excl. bunkers) emissions come from cars, vans, trucks, and buses (i.e. road transport), and these emissions have been growing since 2013 despite CO2 standards for cars and vans in force since 2009. Last year, transport emissions rose by 2.1% (18.7 Mt CO2 equivalent – this is equivalent to all Estonian emissions in 2016). The year before, they rose by 14.3 Mt CO2 equivalent. These figures put into question the EU’s ability to deliver on its Paris Commitments and limit global warming to well below 2 degrees, putting at peril its claims to global climate leadership. Given the long-term EU goal (and necessity) of up to 95% emission cuts compared to 1990 levels, unless control can be levered on transport emissions the goal is clearly in jeopardy. Note 2. So why are transport emissions still out of control given the arsenal of measures that the EU, Member States and cities have at their disposal? The underlying reason is that improvements in efficiency and the penetration of renewable fuels has not kept pace with increasing demand. Passenger and freight activity continue to grow strongly. Governments are unwilling to introduce unpopular measures to curb car use or flights, whilst increasingly freight movements are viewed as an inevitable consequence of economic growth. Efficiency improvements proceed at a snail’s pace. There has been almost no improvement in real world new car CO2 emissions for 5 years (Note 3); no improvement in truck efficiency for 20 years (Note 4); and the slow turnover of the aviation fleet and unambitious targets set for the sector by the UN’s aviation agency, ICAO. Progress implementing alternative sustainable renewable fuels or energy sources remains painfully slow and largely limited to first generation biofuels that have little benefit or in the case of crop-based biodiesel are worse than the fossil fuels they substitute. Note 5. The underlying reasons for the failure to sufficiently improve efficiency differ between the sectors. For cars it is the abuse of the testing system that has undermined real world improvement. For trucks the absence of a regulatory framework. For aviation the lack of EU action and irresponsible delegation of responsibility to ICAO, an industry-dominated body that unsurprisingly has failed to take adequate action. The recent European Commission proposal for post 2020 CO2 targets for cars and vans was an early Christmas present (Note 6) for the industry and fails to set a sufficiently ambitious overall goal or penalise carmakers that fail to supply zero emission vehicles, or to fully address the problem of delivering emissions reductions on the road. The Commission’s 2015 aviation strategy proposed zero actions for reining in emissions from that sector. Note 7. A proposal on truck CO2 emissions is due in the Spring, we will see if it is sufficiently ambitious to finally tackle growing truck emissions. We are stuck in ‘Groundhog Day’, where new measures to curb and decouple our transport needs with CO2 emissions are predictably and inevitably met with apathy by most member states; strong resistance and intensive lobbying from the automotive and aviation industries who wield immense political power and want to retain the status quo to recoup their current investments for as long as possible. The weakening of the recent car CO2 proposal at the last minute (note 8) providing another sad example along with the ongoing discussions in ICAO (Note 9) to remove sustainability controls on aviation biofuels that will drive land-use change. What seems to be lost on our industries is that there is also a monetary benefit to fighting climate change – investing and developing the technologies of the future brings benefits to consumers and wider economy as well as renders the industry itself competitive. 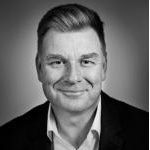 Clinging to yesterday’s technologies will simply lead to the next Nokia moment when a once major global European player is subsumed by their unwillingness to embrace new technology and evolve its business models. For Apple substitute Tesla; for Samsung, BYD. Europe is in danger of surrendering another major industry by failing to drive it to innovate. The Bonn COP reiterates daily: the clock is ticking, we are burning through our carbon dioxide budget and CO2 concentrations are heading to 500 ppm, which would signify the acceleration of dangerous climate change and a likely rise of more than 2 degree Celsius rise in global temperature. Note 10. And the more we delay, the steeper the future cuts will have to be. To break out of the Groundhog Day cycle we need a change of political culture and forward-looking regulators that stand up to vested interests and push industry to transform and develop. There is no shortage of technology – only the mechanisms to ensure it is deployed. Unless the current course is reversed and ambitious (and realistic) measures are put in place without delay, we will continue to warm the planet at dangerously high levels and Europe will become increasingly uncompetitive globally.